1. Go to your iOS Settings. 3. Make sure that your game has permission (toggle button must be green). 4. Try also to toggle the slider off and back on again. 5. Then launch your app while connected via WiFi or cellular. If your game is already enabled, try removing the Facebook account. 3. Tap on your name. 4. Select "Delete Account" and confirm. 5. Select "Remove Facebook Info". 1. Open your Facebook App. 2. In the Settings Menu tap on "Log Out". 3. Open your Game App. 4. From your game's settings select Log In with Facebook. (Make sure that you allow Facebook to access your basic profile). 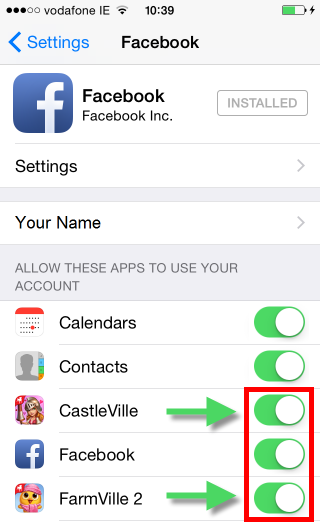 You may re-add your Facebook Account to your iOS Settings when finished. If you still have issues with Facebook Connect, please try our Additional Workaround below. 1. Open your Game App and disconnect from Facebook. If you are already disconnected, proceed to the next step. 2. Open your mobile browser, go to www.facebook.com and log-out from there. Repeat for all browsers on the device. 3. Make sure that you are logged out of your Facebook App. 4. Go back to your game and reconnect to Facebook.